Wings' seventh and final studio album was a marked contrast to the group's previous release London Town. It contained a selection of mostly up-tempo, hard-rocking songs, recorded with the group's seventh line-up. It was a kind of back to the beginning kind of feel to us while we were making it where we were trying different things. The title just seemed to sum it up, Back To The Egg, back to the beginning. Following the departure of Jimmy McCulloch and Joe English in 1977 during the London Town sessions, McCartney decided to recruit new members rather than continue as a trio. Both the new members were suggested by Denny Laine. Laine had moved to a village where he met fellow resident Steve Holly. The drummer was auditioned in the basement of McCartney's London offices. His first work with the group was an appearance in the video for the With A Little Luck single in March 1978. Laurence Juber, meanwhile, had previously appeared alongside Laine on The David Essex Show on British television, and impressed with his skills as a lead guitarist. Also joining Wings for the Back To The Egg sessions was Chris Thomas, who co-produced the album with McCartney. The personnel change caused a shift in the group's sound and outlook, and an eagerness to feed off the punk and new wave music scene helping to inspire some of McCartney's most confident songwriting of the 1970s. Back To The Egg was originally to have been titled We're Open Tonight, but the eventual title was suggested by Linda McCartney. The idea was for a concept piece depicting a band on their journey to a performance, with the egg representing the protective shell of being on tour. It started off being a concept album. It had a travelling idea, where somebody got into their van on a rainy night and was heading towards the gig, but in the end it just ended up being just songs. The cover photograph for Back To The Egg was taken by John Shaw at his studio in London. 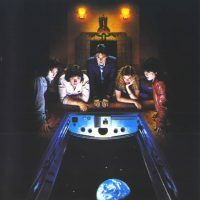 The art concept was by the design company Hipgnosis, who had worked on several previous Wings releases. Linda McCartney had given birth to a son, James, during the London Town sessions, and the family was not keen to relocated to a far flung destination for its follow-up. Nonetheless, sessions took place in five different locations between June 1978 and April 1979. When we put the new album together, we used just about the best 24-track tape machines and all that. But I don't know that what we are doing is really any better than it was in the old days when four tracks were the maximum. It's easy to lose sight of what it's all about and I don't want to. The intention was to capture a live feel in the studio, and most of the basic tracks were recorded quickly in very few takes. The sessions began shortly after the release of London Town. Most of the tracks were laid down live. Most of the backing tracks were recorded as a band with everyone playing their respective instruments. Sometimes songs were put down without drums which were added later. Prior to recording beginning, Wings spent time rehearsing at the MPL offices in Soho Square, London, and in Scotland. First, thank you Joe for working your way through Paul’s solo albums! They’re as familiar and important as The Beatles’ albums to me, so it’s nice to see them recognized here. And you always provide some little details even I didn’t know before! Second, let me express how excellent this album is. It’s really tight, and, as your article said, one of his most self-confident works. Great rockers like “Spin it on”, “Old Siam Sir” and nice ballads like “Baby’s request” or “Winterrose” – and of course the incredible Rockestra-songs. Shame, shame, shame that Paul ended this line-up so quickly with his drug bust in Japan. The tour would have been fantastic. A lot of attention is giving to Band on the Run but in my opinion Ram and Back to the Egg are grossly overlooked. Both very strong and albums. Spit It On and Getting Closer absolutley rock but nobody talks about these songs. I just saw “Transporter” and recognized a sample of “Old Siam, sir”!! It’s a Rap song, here’s the link. Cool video, check it out! Also, “After The Ball/Million Miles” and “Winter Rose/Love Awake” are both medleys. The medley on RED ROSE SPEEDWAY is correctly listed, and I think the pair on ROCK `N’ ROLL are as well. Thanks Joseph – corrected now.